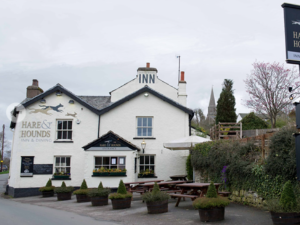 The Hare & Hounds, Levens sometimes limits bookings to 2 or more days. Barn Annexe sometimes limits bookings to 2 or more days. Very large double room, with view. Top floor with King sized bed. Large bathroom with bath & shower. Can fit cot or 2 bed. Bennet sometimes limits bookings to 2 or more days. Double room (large) King size bed. First floor. Large bathroom with bath & shower. It can fit a cot or 2 bed. Cottam sometimes limits bookings to 2 or more days. Double room, can be twinned. King sized bed. can fir cot or 2 bed. First floor. Shower only (no bath). Garnett sometimes limits bookings to 2 or more days. Lot's of lovely, thoughtful touches ; real coffee in rooms, great choice at breakfast, everything well presented.